Shanghai Pudong International Airport (IATA: PVG, ICAO: ZSPD) (SSE: 600009) (simplified Chinese: 上海浦东国际机场; traditional Chinese: 上海浦東國際機場; pinyin: Shànghǎi Pǔdōng Guójì Jīchǎng) is a major aviation hub in Asia, particularly in the East Asian region, and is the primary international airport serving Shanghai of the People's Republic of China. 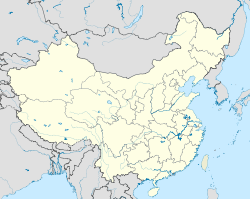 Located about 30 kilometres (19 miles) from the city centre, it occupies a 40 square kilometres (15 square miles) site adjacent to the coastline in the eastern edge of Pudong district within the boundaries of the Shanghai Municipality. 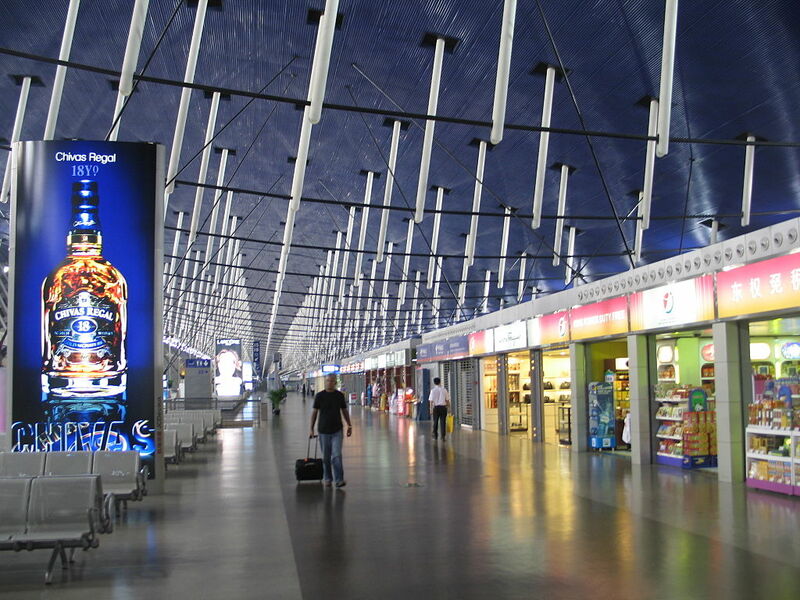 Shanghai Pudong International Airport is a major hub for cargo traffic in the world. With 2,539,284 metric tonnes handled in 2009, the airport is the 3rd busiest airport in the world in terms of freight traffic. 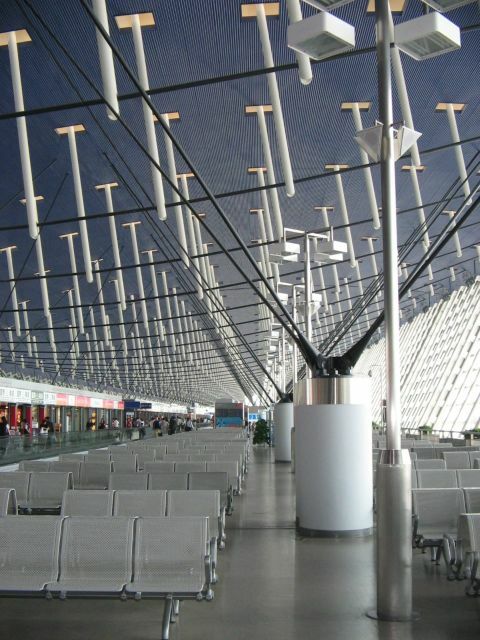 A total of 31.9 million passengers passed through the airport in 2009, making the airport the 3rd busiest in mainland China. However, it handles more international passengers than Beijing Capital International Airport, currently the busiest Chinese airport in terms of total passengers handled, with 17,518,790 international passengers handled in 2007, a 9.0% increase over the previous year. 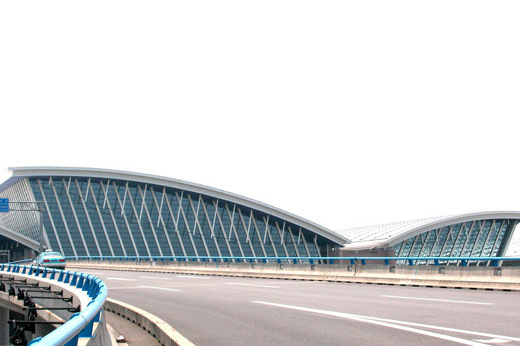 Prior to the establishment of Pudong International Airport, Hongqiao International Airport was the primary airport of Shanghai. 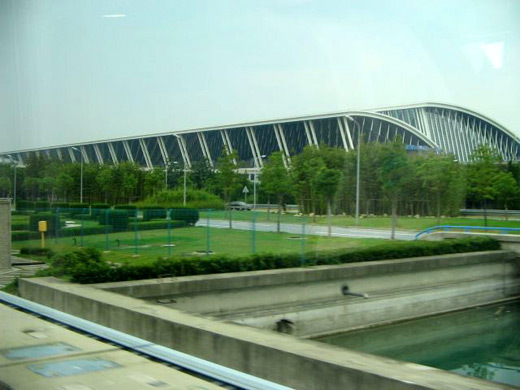 During the 1990s, the expansion of Hongqiao was impossible as the urban area surrounding Hongqiao was developing significantly. 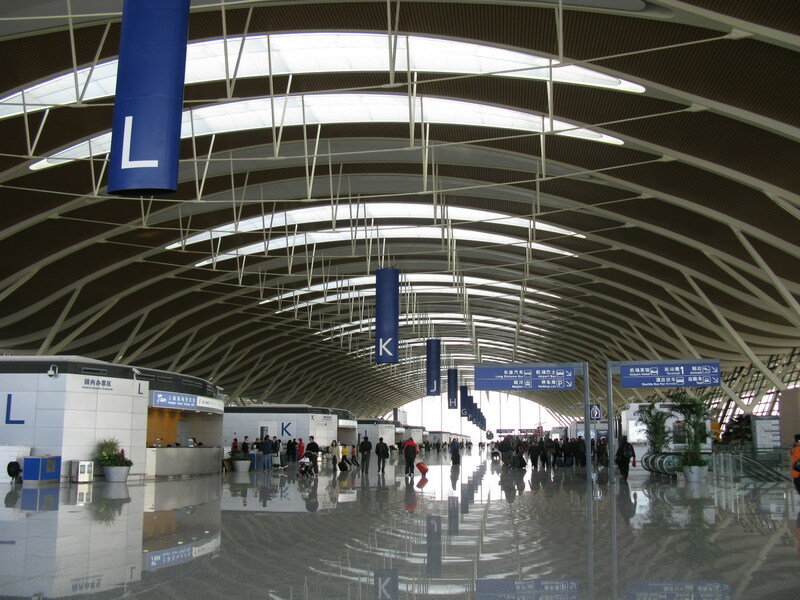 As a result, the government had to seek an alternative for Hongqiao International Airport to take all of its international flights. A suitable site was at the coast of the Pudong development zone to the east of Shanghai. 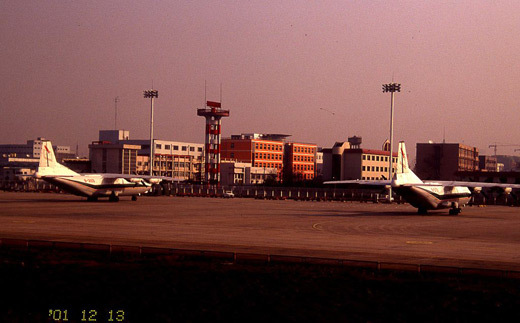 The airport opened on October 1, 1999, replacing Shanghai Hongqiao International Airport as Shanghai's international airport and taking over all of its international flights, including regional flights to Hong Kong and Macau. 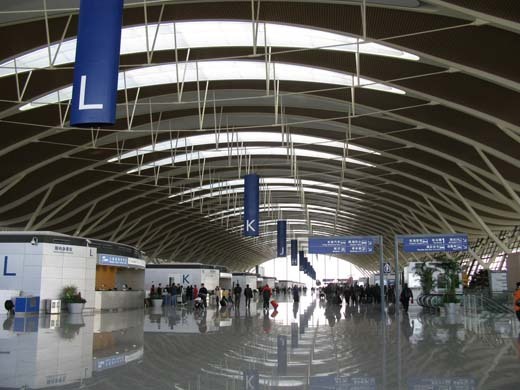 The first phase of the airport began in October 1997 and took two years to build at a cost of RMB 12 billion (1.67 billion USD). It covers an area of 40 kilometers squared and is around 30 km from downtown Shanghai. The first phase of the airport has one 4E category runway (4000 m x 60 m) along with two parallel taxiways, an 800,000 m apron, seventy-six aircraft positions and 50,000 m cargo warehouse. The second and third runways were opened on March 17, 2005 and March 26, 2008 respectively, and a fourth runway is in planning stage. The second terminal was opened on March 26, 2008 and the third terminal is currently at planning stage. The master plan calls for a total of three terminals, two satellite halls, and five parallel runways, ultimately for a capacity of 100 million passengers per year. Limited international services resumed at Hongqiao Airport in October 2007 with flights to Tokyo International Airport (Haneda), in November 2007 with flights to Gimpo International Airport in Seoul, and in June 2010 with flights to Taipei Songshan Airport. This is believed to be a major effort to provide convenience to business travelers, a practice already in place between Haneda and Gimpo for years. Hongqiao, Haneda, Gimpo, and Songshan are much closer to their respective metro centers than their newer but remote international gateways Pudong, Narita, Incheon, and Taoyuan. In 2004, the airport handled nearly 500 flights per day, carrying more than 21 million passengers per year in and out of China's most populated city. Shanghai Pudong International Airport is ranked sixth-busiest in terms of cargo traffic, and 28th in terms of in international passenger traffic. It is also ranked 40th in Passenger traffic, carrying 26,790,826 passengers in and out of the airport. 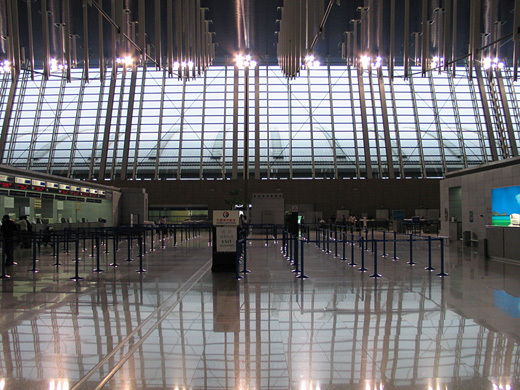 It is the eighth-busiest airport in Asia in passenger traffic. Shanghai Pudong International Airport had recently experienced massive increases, thus never falling below a 10% growth rate of cargo. From 2002–2003, it had seen near double growth of cargo traffic; 87.3% in that period. From 2002–2006, it has risen from 26th place to 6th place in cargo traffic, with cargo traffic tripling since 2002. In 2006, it had a growth rate of 16.8% while Narita (Tokyo) experienced a -0.5% decrease and Incheon with an 8.7% increase. It may surpass Narita International Airport within a few years and Incheon International Airport to become fourth place in cargo and later Hong Kong International Airport, which is the busiest cargo hub in Asia and second-largest in the world. Complementing that, UPS and DHL will be adding hubs in the next few years and therefore, Pudong will become the first airport to have two international cargo express hubs. Pudong sees many aircraft movements during rush hour times, resulting in most planes having to park on the apron. To alleviate this, construction of phase two (including a 2nd terminal, a third runway and a cargo terminal) started during December 2005 and was fully complete in time for the Beijing 2008 Summer Olympics; Shanghai Airport Authority played a major role with improvement of facilities.. The architects of Terminal 2 chose to use many world-renowned interior finishes such as Bentley Prince Street and Brinton carpets for this new terminal. Terminal 2, located behind Terminal 1, opened on March 26, 2008 (same day as the official opening of Terminal 3 at Beijing Capital International Airport), adding an additional capacity of 40 million passengers a year. Once phase two is fully complete, it will give Pudong a capacity of 60 million passengers and 4.2 million tonnes of cargo annually. A transportation center will be added to connect passengers between Terminal 1 and 2 in the future. Shanghai Airlines moved to Terminal 2 upon its opening on March 26, 2008 with 14 other airlines, including Air India, Northwest Airlines, Qatar Airways, Alitalia, British Airways, Qantas Airways, Virgin Atlantic Airways, Philippine Airlines, Malaysia Airlines, Transaero Airlines, Cebu Pacific, Aerosvit Airlines, Garuda Indonesia and Royal Nepal Airlines. Fellow Star Alliance partners Air Canada, Air China, Air New Zealand, ANA, Asiana Airlines, Lufthansa, Singapore Airlines, Thai Airways and United Airlines have moved on April 29, 2008 along with other airlines, involving 33 airlines in all now operating at Terminal 2. The next ambitious expansion, includes the addition of the fourth and fifth runways, a Satellite concourse, larger than the size of both of the current terminals combined, and additional cargo terminals will expand the size of Pudong International Airport. Land reclamation will be included for the fifth runway and some of the cargo terminals. Because of this, a large amount of money will be needed in the future to cope with the demand. This next ambition will be completed by 2015 and will become one of the world-class airports in the world. It will become one of the world's largest airports by land size. Recently, China Southern Airlines stated that Shanghai Pudong International Airport will be home to its five Airbus A380s, however there is no statement if China Southern Airlines will have a hub in Shanghai Pudong International Airport. Starting January 1st 2011, Emirates will operate A380 services to Pudong. The airport had 28 boarding bridges along with 127 parking positions and with a tarmac of 1.49 million square meters prior to the opening of Terminal 2. It also has two runways; the 4000-meter runway on category 4E and the 3800-meter runway with a category 4F rating, able to handle the Airbus A380. It is also predicted that the third runway will be on a 4F rating. 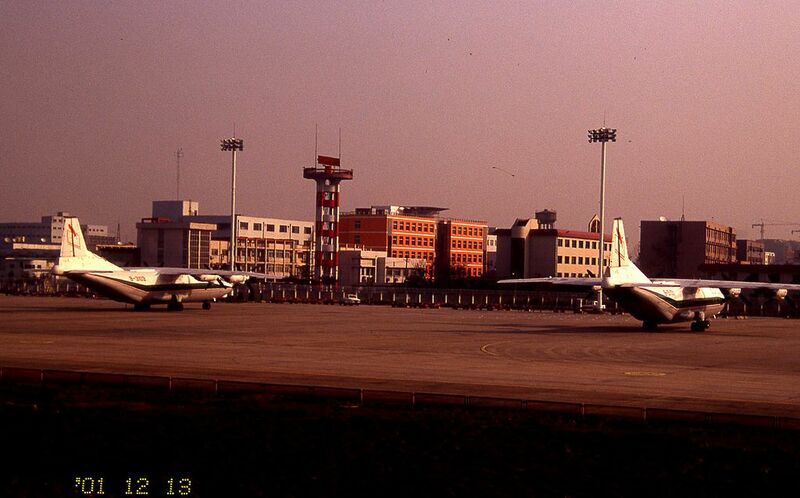 Terminal 1 was opened on October 1, 1999 along with a 4000m runway and including a cargo hub. 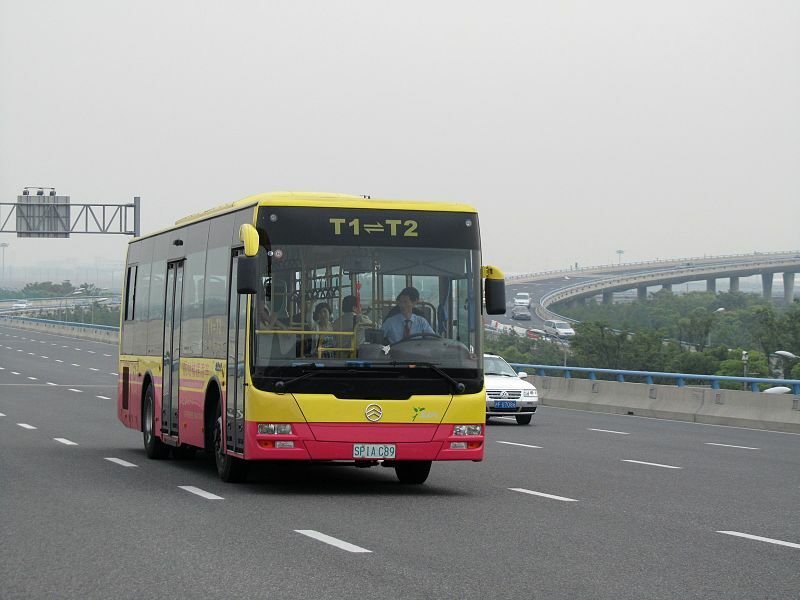 It was built to handle the demand for traffic and to relieve Shanghai Hongqiao International Airport's traffic. Terminal 1 is shaped like Kansai International Airport's terminal, but it is shorter and with 28 gates, 13 of which are double decker gates. The exterior of the terminal is shaped like waves. The capacity of Terminal 1 is 20 million passengers. 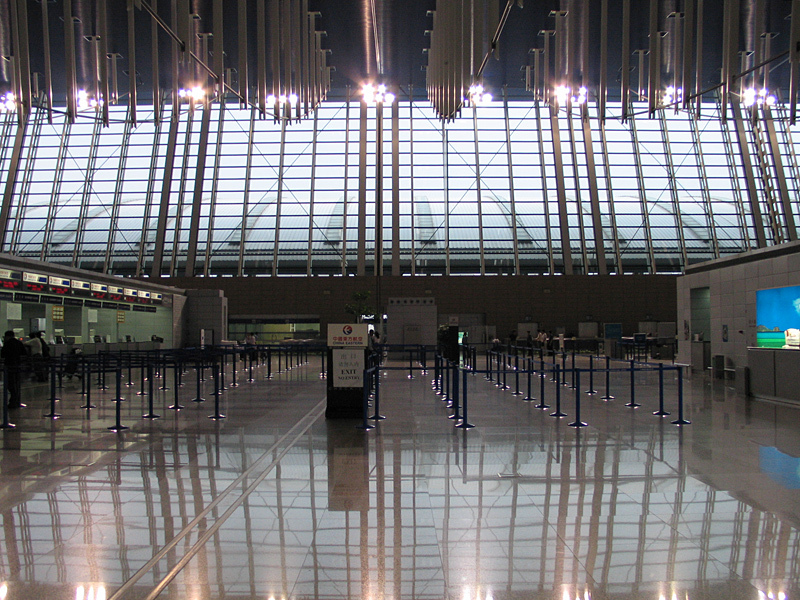 It currently has 204 check-in counters, thirteen luggage conveying belts and covering an area of 280,000 square meters. 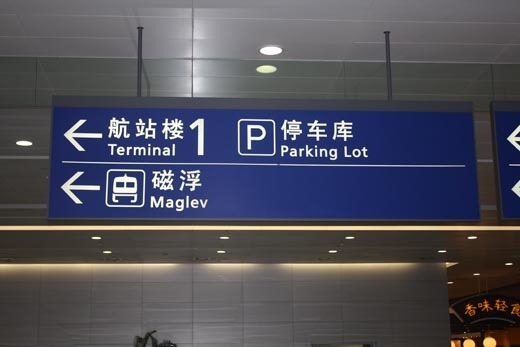 Terminal 1 has received some controversy about the lack of shopping stalls, the pricing of the shops, confusing locations of restrooms, the escalators and passenger difficulty of moving through the terminal. Terminal 2, opened at the 26th of March 2008, along with the 3rd runway, gives a capacity of 60 million passengers and 4.2 million tonnes of cargo annually. Terminal 2 is shaped like the 1st terminal but it has more of a seagull shaping, rather than a wave shape and is slightly larger than Terminal 1. Terminal 2 will be used for Air China, Shanghai Airlines and other Star Alliance members but it is known that some SkyTeam and Oneworld members will relocate their operations to the terminal. 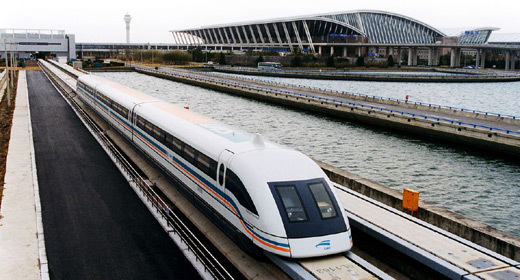 Transrapid constructed the first commercial high-speed maglev railway in the world, from the Pudong International Airport to Longyang Road Metro station. It was inaugurated in 2002. It has a peak speed of 431 km/h and a track length of 30 km. A transportation center will be built in Phase 3, and will become operational in 2015. The extension of the Shanghai Metro Line 2 to Pudong International Airport has finished construction. 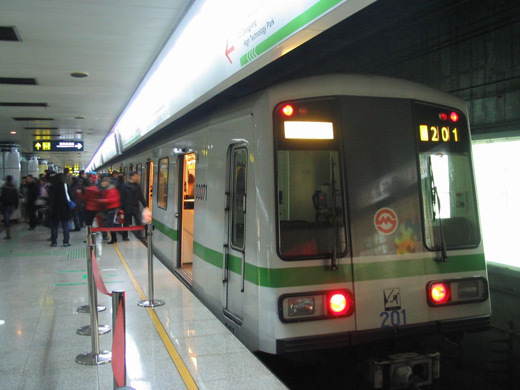 Pudong International Airport and Shanghai Hongqiao Airport are linked by subway. On January 30, 2006, the nose gear of a Cargolux Boeing 747-400F collapsed while parked on the cargo apron. On May 13, 2006, A China Eastern Airbus Industries A340-600 (Tail number B6055), flight 5042 from Seoul to Shanghai suffered tire bursts on all of its main landing gears. None of the 232 passengers were hurt. On November 19, 2006, An Air Canada Boeing 767-300 flight 38 encountered severe turbulence en route to Vancouver from Shanghai. Four cabin members were hurt. The plane safely landed in Tokyo's Narita International Airport. This incident occurred just after a domestic Japan Airlines Boeing 777 flight 1348 experienced turbulence which landed safely in Tokyo's Haneda Airport. On the morning of November 28, 2009, An Avient McDonnell Douglas MD-11F cargo plane registered to Zimbabwe (Reg: Z-BAV) departing for Kyrgyzstan crashed into a warehouse near the runway of the airport due to a tailstrike that caught fire during takeoff and broke into several pieces with seven people on board. Three people died and four were injured. CAUTION 33 cranes working btn Rwys. Fm Rwy thld to 3800' on CL, hgt up to 150', mrk withflags and red lgts. Till Mar 06.